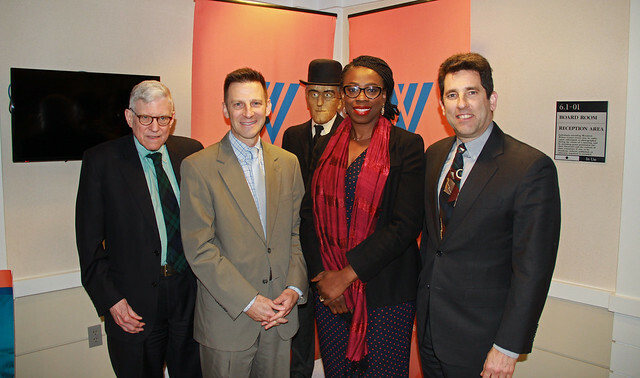 Book Launch: "The Oxford Handbook of Nigerian Politics"
On February 6, 2019, the Wilson Center Africa Program hosted Dr. Carl LeVan of American University for the launch of The Oxford Handbook of Nigerian Politics, edited by Dr. LeVan and Dr. Patrick Ukata. Dr. Chiedo Nwankwor, Professorial Lecturer in the Africa Studies Program at Johns Hopkins School of Advanced International Studies and a contributor to the book, and Ambassador John Campbell, Ralph Bunche Senior Fellow at the Council on Foreign Relations and former U.S. Ambassador to Nigeria, who served as the discussant, joined Dr. LeVan. Mr. Mike Morrow, a Senior Diplomatic Fellow with the Wilson Center Africa Program, moderated the event. Dr. LeVan opened the discussion by acknowledging the recent passing of Steve McDonald, former Director of the Wilson Center Africa Program. He set the background and context for the book, which takes stock of the current state of affairs in Nigeria and is meant to be a resource for academics, policymakers, and practitioners. Dr. LeVan noted that after nearly 60 years of independence, not all analyses of Nigeria must begin with decolonization, and this is reflected in the book. He emphasized the interdisciplinary nature of the book, which features input from a wide range of disciplines, and from both established experts as well as up-and-coming figures. Dr. Nwankwor noted that the book provides a rich tapestry of analysis of Nigerian politics. This comprehensive analysis contextualizes some of the undercurrents of contemporary issues in Nigeria. She highlighted her own chapter on “Women’s Protests in the Struggle for Independence,” which broadens the analysis of women’s roles in Nigeria and argues that women’s status in pre-colonial Nigeria was far better than today. Ambassador Campbell began by also acknowledging the loss of Steve McDonald. He noted the massive achievement of this book, whose comprehensive scope is badly needed to help policymakers understand the nuances of Nigerian affairs before posing questions to the speakers. In the question-and-answer period, Dr. Nwankwor noted that while Nigeria has committed itself to numerous international engagements on women’s rights, in reality, this commitment is poorly reflected in local law and practice. Dr. LeVan noted that three major factors have changed since the last election: the change in leadership of the electoral commissioner, the electoral laws pending signature by President Buhari, and the shifting state of play around who the political parties represent. The speakers also discussed questions of land tenure, civil society, and gender equality discussed in the book’s chapters. The panelists also noted the issues of climate change, population growth, and rapid urbanization as key to policy discussions about Nigeria.